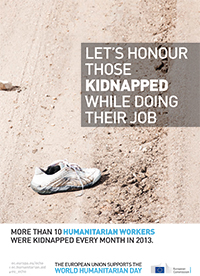 Every year on 19 August, World Humanitarian Day is observed as an occasion to commemorate all humanitarian workers who were the target of attacks and as a result were wounded, kidnapped or even killed. 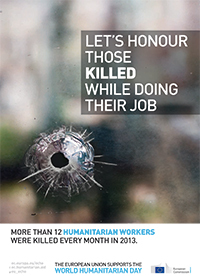 It is an opportunity to remind of the importance to respect International Humanitarian Law (IHL). The date marks the anniversary of the attack on the UN headquarters in Baghdad (Iraq) in 2003 which caused the death of 22 people including the UN Special Representative in Iraq Sergio Vieira de Mello. The European Commission's Humanitarian Aid and Civil Protection department (ECHO) is committed to promoting global respect for and compliance with international humanitarian law (IHL) through advocacy and political measures, as well public campaigns. ECHO has produced a poster campaign which is running for two weeks in airports and metro stations of nine major EU cities: London, Paris, Prague, Amsterdam, Rome, Lisbon, Stockholm, Barcelona, and Berlin. 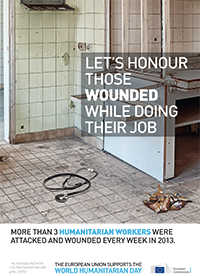 The campaign consists of a series of three posters with messages paying tribute to aid workers victims and calling for more respect for humanitarian professionals. ECHO is promoting World Humanitarian Day also on social media. We will be organizing a Twitter Chat on 19 August at 3PM-4PM to be followed by a Google Hangout at 4.30PM-5.30PM. To honour and thank humanitarians ahead of this year's World Humanitarian Day, we have also started a hashtag campaign with #Ihonour. The 'Humanitarians at risk' blog series, dedicated to World Humanitarian Day, features testimonies of humanitarians around the world who risk their lives daily, while saving those of others.